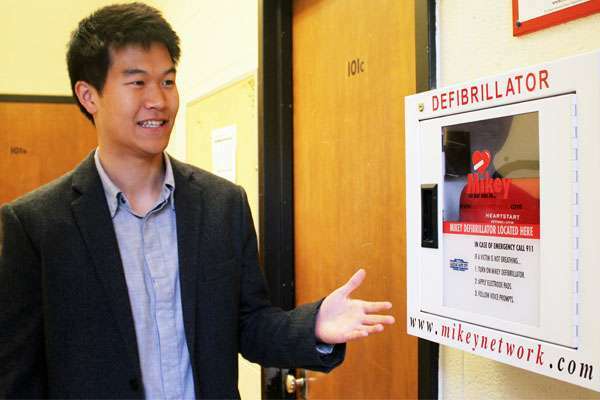 Walking through an office building on St. George Street, Engineering's Christopher Sun quickly spots a portable automated external defibrillator (AED) conveniently tucked near the side of the entrance. From 8 a.m. to 9 p.m., its accessibility could be vital in saving a life. But after the building closes at 9 p.m., it is almost as if the AED isn't there. That problem is what the PhD student's research is examining, with Professor Timothy Chan of Mechanical & Industrial Engineering and in collaboration with St. Michael's Hospital and its Rescu program, led by Dr. Laurie Morrison. Sun recently presented their findings at the American Heart Association (AHA) conference in Orlando. Chan had previously presented at the AHA conference in 2010, sharing his findings on the placement of registered AEDs in Toronto and Peel Region. What he discovered back then was that spatial distribution of AEDs was not optimal. "Our original finding was that less than one in four cardiac arrests occurred near an AED," Chan said. Sun's research takes that research a step further. "Previous work has focused almost entirely on spatial factors," said Sun. "Time factors, such as when cardiac arrests occur and the time of day, have been largely overlooked. "We found that if we do take into account time, there is a significant decrease in perceived coverage of cardiac arrests." Based on the hours of the buildings where AEDs are placed, the research revealed that AED coverage was diminished more than eight per cent during the day, 28 per cent in the evening and 48 per cent at night. His research also found that only some buildings in Toronto are accessible 24 hours a day and seven days a week. Many AEDs are located within office buildings, schools and recreation facilities, which tend to be open for a limited set of hours during the daytime. "There's definitely a gap there," said Sun. That gap can be the difference between life and death. Over a period of roughly eight years, 2,440 out-of-hospital cardiac arrests occurred in Toronto. Of those that occurred near an AED, approximately one in five occurred when an AED was inaccessible. "Emergency medical services and investigators are united and willing to reposition AEDs to locations that are accessible," said Dr. Morrison, an emergency medicine specialist at St. Michael's and collaborator in the research. According to Sun and Chan, the true coverage of cardiac arrests is overestimated when temporal factors are not considered. To address this issue, they have developed an optimization approach that can regain that lost coverage by optimizing AED deployment in more time-available buildings. This research was also recently presented at the AHA conference. "We've developed the first mathematical optimization approach for AED deployment that considers both spatial and temporal availability to improve cardiac arrest coverage," said Chan, who is the Canada Research Chair in Novel Optimization and Analytics in Health, and leads the Centre for Healthcare Engineering (CHE) as well as the Applied Optimization Lab (AOL) at U of T Engineering. "We found that our model provided the largest improvement in coverage during the night, which was precisely when the largest loss in coverage due to limited temporal accessibility was experienced, as well as when survival was lowest." Chan said he hopes this research demonstrates how critical temporal accessibility is to both the measurement of true cardiac arrest coverage as well as the decision on where to locate AEDs. "Our optimization model can be beneficial towards developing policies and guidelines for AED placements across the world, and ultimately to help save more lives," said Chan. Alongside Sun's findings, Chan's AOL researchers will continue to focus their attention on the city's distribution of AEDs. The lab is analyzing the optimization of defibrillators in high-rise buildings, as well as in Toronto's heavily frequented PATH underground walkway.